In recent years, the Storm didn’t have to put much thought into how they would use their first-round pick in the WNBA draft. In 2016 and ’15, Seattle decided early in the evaluation process to use the No. 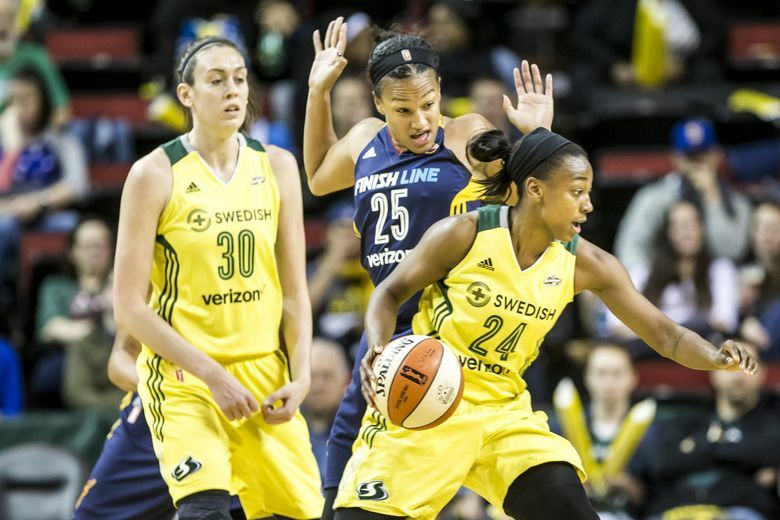 1 overall selection to take Breanna Stewart and Jewell Loyd – a pair of cornerstone players who each won Rookie of the Year honors. Seattle didn’t have a first-round pick in 2017 and last year was determined to use the No. 5 overall pick on an heir apparent to star Sue Bird, which resulted in the team selecting point guard Jordin Canada. This year things are more complicated for the Storm, which has the last pick (12th, 24th and 36th overall) in each of the three rounds of the WNBA draft that begins 4 p.m. Wednesday on ESPN. Who might the Storm select with the No. 12 overall pick? “When you don’t have the No. 1 overall pick, the depth of the evaluation and the research is more extensive,” Storm president and general manager Alisha Valavanis said. “It’s a different position. In many ways, this year’s draft is a luxury and a burden for the defending WNBA champions, which returns a veteran team poised for another run at a title. Barring unforeseen changes, the starting lineup is set with Bird and Loyd in the backcourt and Stewart, Natasha Howard and Alysha Clark on the frontline. The rotation of reserves — including guards Canada, Sami Whitcomb, Kaleena Mosqueda-Lewis and forwards Crystal Langhorne and Courtney Paris — is also unlikely to change. Conceivably, whomever Seattle selects on Wednesday will have to compete against Russell and Teana Muldrow, a 6-foot-1 forward who signed a training-camp contract, for a chance to stick with the team. “You look at a team like Seattle that is coming off of a championship and has so much talent on their roster, this pick is not changing their team,” ESPN analyst Kara Lawson said. “This is a pick to try to get a good young player into their team and down the road hopefully have them contribute significantly. Minnesota Lynx coach Cheryl Reeves, who won four titles during a seven-year span (2011-17), said it’s difficult finding players at the bottom of the draft that are able to help a team with title aspirations. “We just hoped and prayed that we would have early entries,” she said. “We hoped and prayed that maybe somebody would fall, and it almost never happened. Not surprisingly, the Storm didn’t tinker with the roster during the offseason and doesn’t need to address any obvious weaknesses. Seattle ranked second in scoring while averaging 87.2 points and was fifth in points allowed at 79.7. The Storm set a WNBA record with 307 three-pointers and was third in the league in opponents field goal percentage from the field (43.5 percent) and three-pointers (33.8). The 38-year-old Bird is the oldest player on a team in which the average age is 28. Six players are under 30 and five are older. Eight Storm players are signed through 2020, not including Bird, Stewart and Paris whose contracts expire after this season. Last year, first-year coach Dan Hughes emphasized a defensive approach and brought in Howard and Paris, which improved Seattle’s post defense and rebounding. In an ideal scenario, the Storm will continue to bolster the defense through the draft. A compilation of several mock drafts has the Storm using its first-round pick on Iowa’s 6-foot-3 center Megan Gustafson, Notre Dame’s 6-4 forward Jessica Shephard, Missouri’s 6-1 guard/forward Sophie Cunningham or China’s 6-9 center Han Xu. Whoever Seattle selects, Valavanis doesn’t want to disrupt a team that easily finished first in the league at 26-8 before posting a 6-2 record in the postseason. “We have a really strong roster,” she said. “We have a strong culture and a championship culture in place. I feel like that culture is going to protect itself, but we’re very mindful of who we add to the roster and who becomes a part of this with us because it’s only more difficult the year after a championship to compete. — The Storm announced a 10-year partnership with Symetra Life Insurance, which allows the Bellevue-based company’s logo to appear on Storm jerseys. The deal is the largest in Storm franchise history.